Doesn’t time fly? Once again it is time to review the state of the Northern League; the wargames competition scene in the North of England. 2017 was a year of change. The League saw its very first Art De La Guerre (ADLG) competition and no Field of Glory (FOG) competitions at all. The absence of FOG R was deliberate but that of FOG AM was due to lack of support. One further change was that ADLG introduced a different format for the day: three 2.25 hour games with small 200 point armies. The DBMM format was unchanged from the standard: two 3.50 hour games with 450 point armies. ADLG looks to have made a very strong start and has helped stabilise the League. The absence of FOG AM & R did not have a material effect. Over the years the number of DBMM players has proved remarkably stable. Since 2008 it has attracted an average of 11.2 ± 1.9 players per round. The teams playing DBMM tended to play in most rounds (4.32 ± 1.06 rounds played per team) which was a lot higher that the ADLG competition (3.18 ± 1.67 rounds played per team). I suspect this indicates players "dipping in" to the new ADLG competition. The DBMM teams were mainly doubles whilst the ADLG teams were mainly singles. This is not really a surprise given the much smaller size of the ADLG armies. 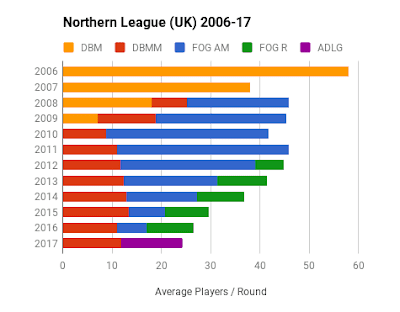 Many of the ADLG players were former FOG AM players. This suggests that a 2018 FOG AM competition may struggle. Even so the League has offered to run a FOG AM competition next year. Firstly, Mick Hood should be congratulated for his efforts in establishing the ADLG competition. He acted as list checker and umpired all five rounds. He's been both a driving force behind ADLG in the Northern League and a great help to players new to ADLG. As to the future I hope the strong start of ADLG continues and more players return to the League. Looking at the long term trend, the League can ill afford to continue dropping one or two players every year. Fingers crossed. I plan to attend at least two of the five rounds scheduled for 2018. I'll be looking to play ADLG in the open rounds and then in any medieval themed rounds. As to the other rounds I don't have suitable armies so will have to skip those. At the time of writing the details for 2018 have yet to be finalised. Once firm they will be posted on the MAWS Northern League page.